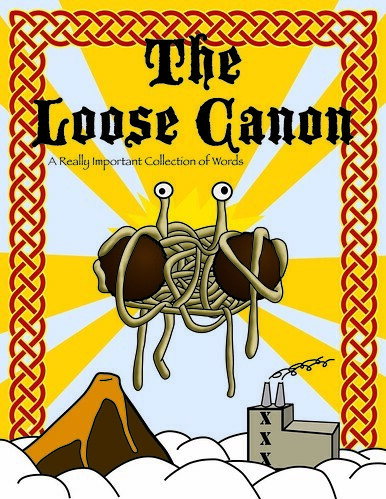 Found a stunning new portrayal of His Noodly Majesty? New art, adapted art, links to do-it-yourself art? Realistic, conceptual, whatever? Post it here. Wait... this is actually happening? :blinkblink: For reals this time? I'm willing to take a look at the cover file (under my professional title of Graphic Designer) once it is approved. If I can get all the build files, I'll make sure it is high res, vector graphics, etc. as much as possible so as to provide the highest quality print. Ham Nox wrote: Wait... this is actually happening? :blinkblink: For reals this time? Rev. Rowan Redbeard wrote: I'm willing to take a look at the cover file (under my professional title of Graphic Designer) once it is approved. If I can get all the build files, I'll make sure it is high res, vector graphics, etc. as much as possible so as to provide the highest quality print. In layman's terms, it means that I would be happy to take look at the digital file that Tig has created, and all the bits and pieces used to make it. Then, I'll use my skills as a professional graphic designer to fix anything that might affect the quality of the final print. Basically, I'll take the final layout/design of the book cover and I'll make sure that it looks as good in print as it does on a computer screen. And perhaps make it bigger? I think it's being expanded to fit the cover page, and we're losing some clarity from that. Maybe Tig can do that too, though. Qwertyuiopasd wrote: I think it's being expanded to fit the cover page, and we're losing some clarity from that. I really wish i'd joined this forum several months earlier. I would have loved to contribute something to it. If you ever do anything else, i'd love to help in any way I can. Roland Deschain wrote: I really wish i'd joined this forum several months earlier. I would have loved to contribute something to it. If you ever do anything else, i'd love to help in any way I can. Keep in mind the third announcement regarding canonical belief; this is just a first edition. I don't know exactly when we might release a second edition, we aren't quite that Promethean, but probably whenever we... unearth enough new scripture to warrant a re-release, we will. Basically, if you write it or draw it and up it in the forum, we can put it in the Loose Canon at some point. But yes, we'll still accept submissions up until the time we give the final A-Okay! Its ok I do lol. @ Rev Rowan I can send you my original Illustrator file via email so you can make sure its nice and shiny. While I'm a student Graphic Designer I'm going to trust you know more about what you're doing than I do. Also not having Illustrator on my home computer makes it even harder) Just PM me the email address where I should send it. Thanks to Reverend Rowan we have our completed cover!!! He blinded me with photoshopped pasta! Many thanks to all who contributed to the cover design. Pasta be upon you.